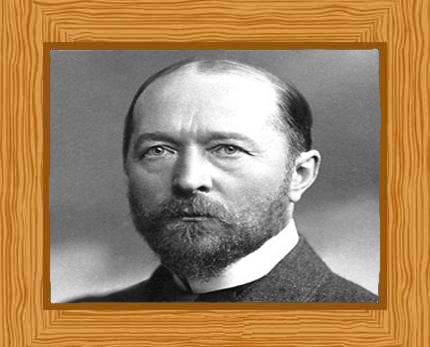 Emil Adolf von Behring and a bacteriologist and was awarded the first Nobel Prize in Physiology and Medicine in 1901. He was a brilliant man best known for his discovery of diphtheria and tetanus vaccines. His tetanus vaccine helped save the lives of millions of wounded soldiers during the First World War (1914 – 1918). Emil Adolf Behring was born on 15 March 1854 in Hansdorf, Germany. He was the eldest son of a schoolmaster from his second wife-the family had a total of 13 children. He attended university but with so many children the family had a difficult time paying for his university fees. So he switched to the well-known Armey Medical College at Berlin. This gave him a way to study but it also meant that he had an obligation to stay in military service for at least ten years once he had received his medical degree in 1878. He married Else Spinola in 1896. She was the daughter of the Charité Director at Berlin and during their marriage they had six sons. Two years after he obtained his degree, he passed the State Examination and was sent to Wohlau and Posen in Poland as an assistant surgeon. In addition to his practical work in Poland he also made sure there was time to study problems concerning septic diseases, studying at the Chemical Department of the Experimental Station. From 1881-83, he carried out investigations on iodoform, which was used to treat wounds, and its disinfecting effects. He proposed that iodoform didn’t kill microbes as was the popular belief, but that it neutralized poisons given off by microbes and acted as an antitoxic. The first scientific publication of his findings was published in 1882, “Experimentelle Arbeiten Über desinficierende Mittel” (Experimental Works on Disinfecting Agent). The governing body in charge of military health was very interested in preventing and combatting epidemics. Once they were made aware of Behring’s abilities they sent Behring to Carl Binz, a pharmacologist, so he could receive more training in experimental methods using animals. In 1888 Behring returned to Berlin where he worked under Robert Koch at the Institute of Hygiene at the University of Berlin. Diphtheria is caused by bacterium that thrives in poor sanitary conditions. In the late nineteenth century over 60,000 children died each year in the German Empire from the disease. Tetanus is caused by an infection with bacterium that lives in the soil. At that time it was a leading cause of death in wars, killing the wounded. Behring worked with Koch for several years at the institute developing his theory of antitoxins could help fight these diseases. He collaborated with Shibasaburo Kitasato, a guest researcher from Tokyo University, on identifying the substance that provided resistance against tetanus in rabbits. The experiments involved taking blood samples from a rabbit that had been immunized against tetanus and injecting the serum into non-immune mice, which themselves were infected the following day with tetanus bacteria. The results showed that the pre-treated mice became immune and did not show any symptoms of tetanus, while the control animals died shortly after being infected. They showed that antitoxins (antibodies) produced by one animal could be removed and used to immunize other animals. They jointly published a paper in 1890 proposing a blood serum therapy to induce immunity for tetanus and also for diphtheria. The following year Behring worked with Doctor Erich Wernicke, carrying out experiments on guinea pigs. They were successful in immunizing guinea pigs against diphtheria. They also showed that other guinea pigs injected with the serum from immunized guinea pigs and then infected with diphtheria bacteria did not become ill.
Behring and Wernicke wanted to produce a diphtheria serum that would work on humans, but this would cost money to produce. They invested their own money to produce serums from larger animals, such as sheep. In 1892, Behring received funding from Farbwerke Hoechst which in turn would obtain the rights to produce and distribute the serum. From 1894, Farbwerke Hoechst began supplying phials of diphtheria serum. Progress was still slow so Behring turned to using horses at a vet school to obtain larger quantities of serum. There was still, however, an issue with the serum potency. In 1897 physiologist Paul Ehrlich realized that the potency of antitoxin (antibodies) reached a maximum strength, not initially, but after a certain amount of time. With this knowledge, standardizing the serum became possible. Clinical trials on sick children in Berlin hospitals were carried out and mortality rates of diphtheria were halved. In 1913 Behring devised a new toxin-antitoxin preparation that gave increased immunity to diphtheria. Behring moved to follow Koch when the latter transferred to the Institute for Infectious Diseases in 1891. In 1894 Behring became professor of hygiene at Halle and a year after that he accepted the same position at Marburg. In 1899, Behring switched his interest to finding an antitoxin for bovine tuberculosis, but his experiments were not successful. Behring’s health took a turn for the worse in 1901 and this prevented him from taking part in regular lectures. Seeing as he could no longer teach, he dedicated himself to studying tuberculosis. A commercial worker helped him build a lab in Marburg where he could work on his vaccines. He founded the Behringwerke which made vaccines and sera for diseases. His work vaccines and sera made him a rather wealthy man. He bought a large estate in Marburg and kept lots of cattle which he used for experiments. He received the first Nobel Prize in physiology and medicine in 1901 for his work on serum therapy against diphtheria and tetanus. Emil Adolf von Behring died on 31 March 1917.